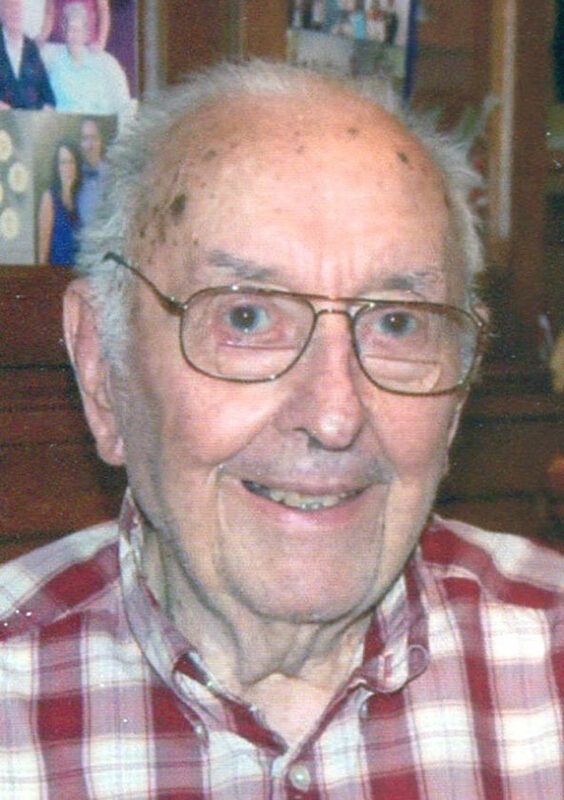 Henry M. Cheney, 98, of 366 Kiantone Road, Jamestown, passed away Saturday Aug. 11, 2018 in his home on the family farm where he was born Nov. 14, 1919 to Lewis H. and Blanche Gilman Cheney. He was a member of the Jamestown High School class of 1937 and a graduate of Jamestown Business College. Henry took over Cheney Farm from his father and successfully ran the dairy farm for his lifetime with his sons who continue today. He was a lifelong member of First Covenant Church where he served as a trustee, vice chair, and on the board of Covenant Manor. He was also a member of the Frewsburg Central School board for 14 years; BOCES School board during their building program; Town of Kiantone Supervisor for 10 years; a member of the Farm Bureau and various farm organizations; and President of the Kiantone Maple Grove Cemetery for 55 years. Henry and his late wife Ruby were blessed to have been able to travel together throughout the world including Alaska, Okinawa, Japan, Hong Kong, Hawaii, Great Britain, Sweden and Germany. They cruised the Mediterranean, traversed the Panama Canal and sailed the Queen Elizabeth II to Britain. They also enjoyed several cross-country train rides through Canada and the United States. Henry loved all things family. He was a beloved husband, father, grandfather and great grandfather. He rejoiced in the accomplishments of all his loved ones and was well known for his generosity, kindness and graciousness to all he met. Every August Henry could be found happily presiding over his sweet corn stand at the farm, chatting and reminiscing with all who stopped by. Surviving are five children: Kathleen (John) Pearson of Batavia, Ill., Cynthia (Vic) Erickson of Carol Stream, Ill., Barbara (Carl) Engstrom of Marshfield, Mass., Morris (Judy) Cheney and Steven Cheney, both of Kiantone; 10 grandchildren: Christopher Pearson of Muncie, Ind., Amy (Jay) Nichols of Woodridge, Ill., Sarah (J.C.) Andre of South Pasadena, Calif., Amanda Lemay of Boston, Mass., Abigal Engstrom of Duxbury, Mass., Seth (Elizabeth) Cheney of Pittsburgh, Pa., Cynthia (Will) Ueland of Penfield, N.Y., Rebecca Cheney of Ontario, N.Y., Rachel (Cody) Peace of Jamestown, Adam (Chelsea) Cheney of Denver, Colo.; 13 great grandchildren; and numerous nieces and nephews. Besides his parents, he was preceded in death by his wife Ruby Anderson Cheney whom he married June 28, 1941 and who died Oct. 15, 2013; a sister, Ruby Waite, and a brother, Lewis H. Cheney Jr.
A memorial service in celebration of Henry’s life will be held at 11 a. m. Saturday Aug. 25, 2018 in First Covenant Church. The Rev. Adam Rohler, pastor, will officiate. Inurnment will be in the Maple Grove Cemetery, Kiantone at the convenience of the family. A reception will follow the service in fellowship hall of the church where the family will greet friends. Memorials may be made to First Covenant Church, 520 Spring St., Jamestown, N.Y., 14701; Camp Mission Meadows, 5201 Route 430, Dewittville, N.Y., 14728; Chautauqua Hospice & Palliative Care, 20 W. Fairmount Ave., Lakewood, N.Y., 14750; or to the Kiantone Congregational Church, 646 Kiantone Road, Jamestown, N.Y., 14701.